Pope Francis is hopeful about relations with China, which are not just based on diplomatic talks but also on cultural exchanges and friendship. For him, Card Zen is "a little scared". Vatican City (AsiaNews) – Pope Francis was interviewed by Philip Pullella of Reuters. In the tête-à-tête, the pontiff said that with respect to the dialogue with China, "We are at a good point". In addition to diplomatic channels there are friendships and cultural exchanges. The Chinese people are "very wise" and know how to wait. 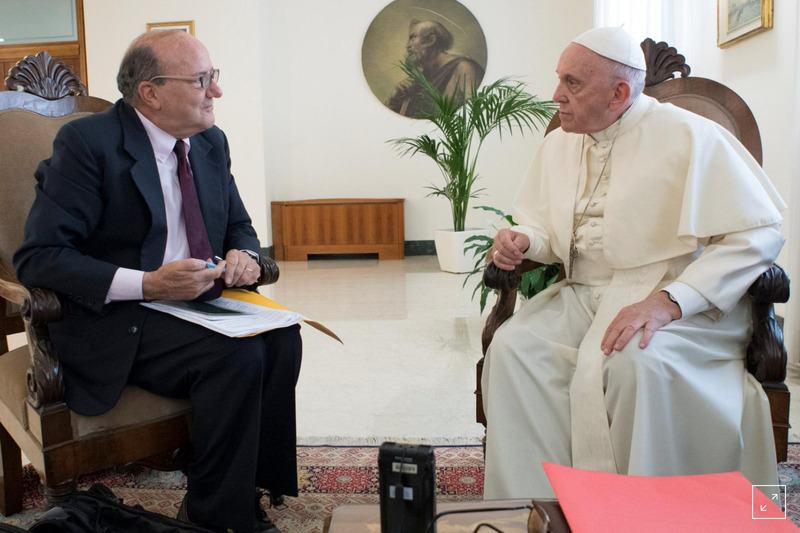 By kind permission, we publish here a translation of an excerpt from the registration of the interview between the Holy Father and the journalist two days ago. Q: How is the rapprochement with China? R. We are at a good point, but relations with China follow three different paths. First of all, there is the official one. The Chinese delegation comes here, takes part in meetings, and then the Vatican delegation goes to China. Relations are good and we have managed to do good things. This is the official dialogue. Then there is a second dialogue, of everyone and with everyone. "I am a cousin of the minister so and so who sent me to say that . . .". There is always an answer. "Yes, all right, let's go forward.” These side channels are open, let’s say, at a human level, and we do not want to burn them. We can see goodwill, both from the Holy See and the Chinese government. The third path, which for me is the most important in the rapprochement with China, is cultural. Some priests work at Chinese universities. Then there is also culture, like the exhibit that was put on in the Vatican and in China. This is the traditional path, like those of the great ones, like Matteo Ricci. I like to think about relations with China as, multifaceted, based not only the official diplomatic one, because the other two are very enriching. I think things are going well. In your question, you mentioned two steps forward and one step backward. I think the Chinese deserve the Nobel Prize for patience, because they are good, they know how to wait, time is theirs and they have centuries of culture . . . They are a wise people, very wise. I respect China a lot. Q: How do you respond to concerns such as those of Cardinal Zen? A: Cardinal Zen taught theology in patriotic seminaries. I think he's a little scared. Perhaps age might have some influence. He is a good man. He came to talk to me. I received him, but he's a bit scared. Dialogue is a risk, but I prefer the risk to the sure defeat of not talking. With respect to time, someone mentioned Chinese time. I think it is God's time, forward, calm. The twin exhibit at the Vatican and in Beijing, decided last November, should have been held in March 2018, but, according to Vatican sources, has not yet been realised for "technical reasons".